Cut in quarters and remove seeds then give them a rough chop. Add to a medium, heavy bottom saucepot and place over high heat. 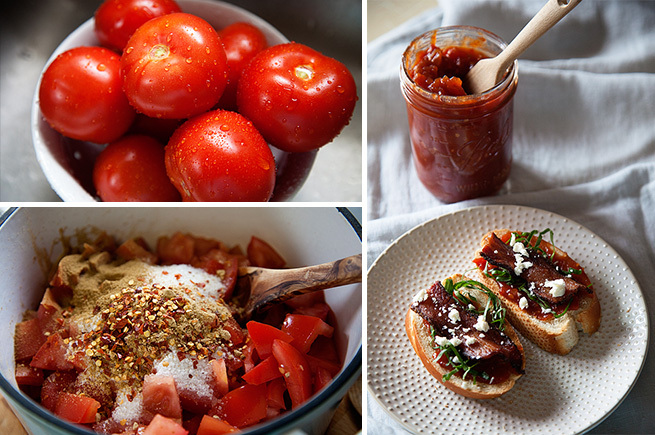 Add remaining ingredients and let tomatoes come to a boil. Reduce heat to medium-low and let simmer, stirring occasionally for 1 hour and 15 minutes or until it’s nice and thick like jam. You should be able to run a spoon down the center of the pot and the jam will stay in place. Place in a jar, refrigerate for up to one week. Recipe Courtesy of: Heather Thoming of Wipperberry.